Staff: Nick Barrable, Louise Longhurst, Doug Tullie, Ben Windsor, Bex Harding, Roger Thetford. As last year, we took a late August date - 13 days - starting on a Tuesday 13th August - Sunday 25th August. Only 1 athlete came a day early this year and Scott Fraser took care of him in Södertalje as he flew into Skavsta. All left on Sunday. Some were back in their Scottish Schools on the England BH Monday. Some Scottish athletes missed a couple of days of school in the preceding week too. The policy/process seemed to work smoothly and there were no oversights/complaints, unlike last year, so the new version would seem better. We had a few 'no's which we knew about in advance which was very helpful. Sue Marsden provided the invaluable results excel spreadsheet. We took 9 girls and 10 boys - with 3 of the boys and 3 of the girls being top year 16s - the rest were 1st year 18s. Most days there was a swim in a Lake - often at Hellasgården itself. The MTBO competition turned into training as the race got moved. I think the athletes enjoyed doing something a bit different. The Roller skiing, TrailO and VO2 max testing didn't come off, but more due to lack of time to pursue them, but I might try again next year! I have just done a good TrailO in Northern Stockholm I hope we can use in 2014. We did manage to sort out an Olympic Weights training session with a guy who has worked with Ravinen and Farsta OLGY before. He is a former Olympic Coach and was well received. 2 x 90 minute sessions (we split the boys and girls up.) was well worth it. We got tour blue hoodies and black technical Ts done the same as last year from ethicstar in the same colours. They seemed to go down well and certainly the hoodies are very good value. Results wise, Julie Emmerson won D18E Middle at the Sorundadubbeln (400sek voucher for an O shop!) Sarah Jones would have won the long on the following day by almost 9 minutes (!) had the class not been voided as a control had been put out in the wrong place. In the guys, Sasha Chepelin was 2nd on the Sorundadubbeln Long, +3:48 but almost 2 minutes clear of OK Ravinen H18 superstar Emil Granquist who won H18E at the O-ringen, Silver at JEC - this was an excellent performance by Sasha, still a 16. He also won the Middle Club Champs, pipping Ravinen's Swedish Squad star M20 by 7 seconds, who had recently arrived back from a pre-JWOC training camp to Bulgaria. At Melkes Minne Relay, the format had changed to 2 runners running 2 legs on a Sprint spec forest map. Joe Woodley was on fire and together with Dane, they won the H20 class. The Malbon/Adams duo were 3rd, +9.01. On D20, Sarah Jones and Natalie Beadle were 3rd. Our M16s failed to deliver coming in 5th. Our D16s were in the mix but ended at the back of the pack in 4th. See results round up below. I borrowed Farsta OLGYs SI and mini-kites, and reused a lot of maps/exercises from Farsta OLGY and Ravinen technical training so saved a huge amount of time and printing there. BML paid for the printing of 200 x A4 waterproof maps. So big thanks to them. We had some map permissions to pay for, some we got free and some Ravinen paid for directly. Louise managed very well in the kitchen and the coaches in the forests. The athletes were a delight as usual. Ralph Street came up from Södertälje and Cat Taylor came down from Uppsala to visit, each of them training with us and staying overnight. Cat gave an inspirational talk and Ralph related very well to the athletes: the boys were quizzing him intently after the day’s training. Ruth Holmes also joined us for the last couple of days. The Camp is predominantly for M/W17’s born in 1996 and top M/W16’s born in 1997. 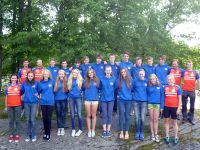 The tour athletes will be selected by Nick Barrable (OK Ravinen) and the selections will be reviewed by the Chairman of Junior Regional Orienteering Squads (JROS).